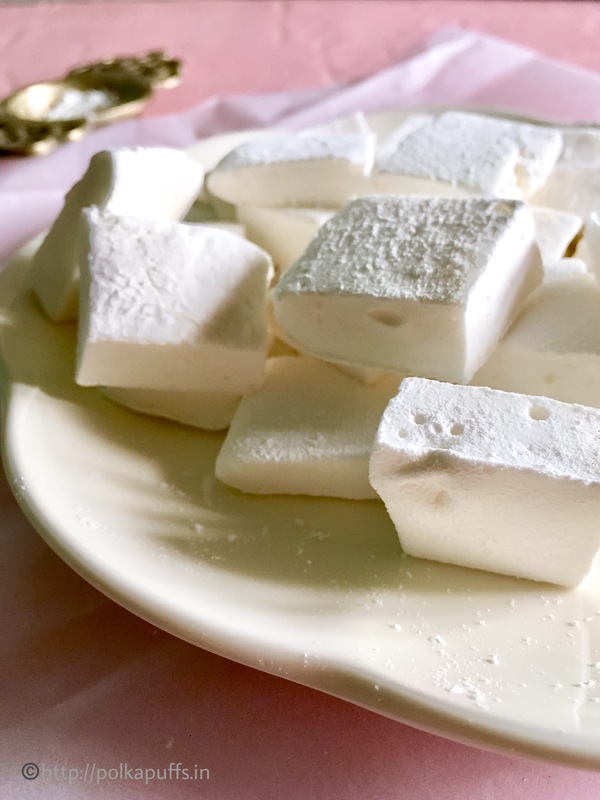 I always wanted to make marshmallows at home and these Small Batch Vanilla Mini Marshmallows are the bomb!! These make for the perfect topping for my hot cocoa. I may not have a snowy view outside my window, I still have these little beauties . 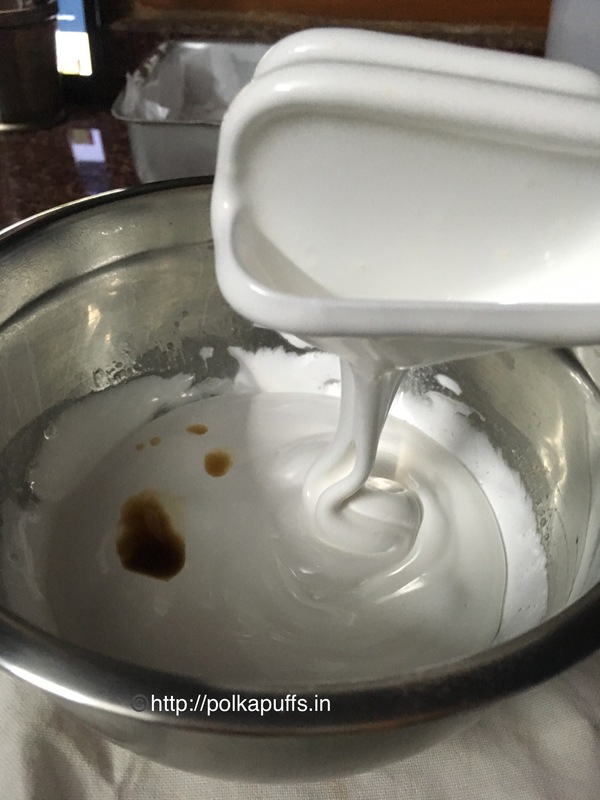 You will need some instruments needed for making Small Batch Vanilla Mini Marshmallows. A candy thermometer, a sieve, measuring cups, spoons, a large mixing bowl, 7*7 inch baking pan (if making mini marshmallows) or a 5*9 inch loaf pan (if making large squares), a heavy bottom sauce pan, electric hand whisk, a silicon spatula. Keep all the ingredients ready and measured on the work surface because once you start, this recipe moves really fast. Choose the pan which you want to use. Line it with parchment paper. Dust the pan liberally with confectioners sugar and ensure you cover every corner. Take 3 tablespoons of water in the mixing bowl and sprinkle gelatin over the water. Do not stir. Set it aside so that the gelatin can bloom. In a saucepan, add granulated sugar, corn syrup, a pinch of salt and 3 tablespoons of water. Stir them together. Turn the flame on high and let the ingredients come to a boil, do not stir them. Clip on a candy thermometer on the side of the pan. Let the ingredients boil till the temperature reaches 238’F. Once the sugar mixture reaches 238’F, take it off the heat and keep your electric hand whisk ready. Pour the sugar mixture slowly into the bowl and simultaneously start whisking in the mixture with the bloomed gelatin. Add the sugar mixture very slowly and keep whisking at a medium speed for 10 minutes. This is how the texture should be after beating the mixture for about 8-10 minutes. Next, add the vanilla extract. Give this mixture one last whisk and pour the mixture into the prepared pan using the silicon spatula. Let this mixture set for about 2-3 hours at room temperature. After the marshmallow has set, dust the top with more confectioners sugar and let the marshmallow sit in the pan for another 6-7 hours. 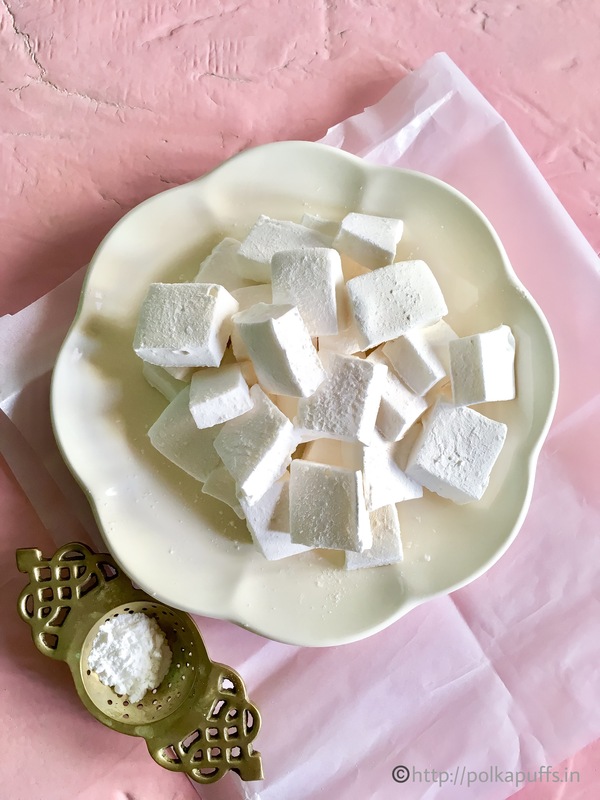 Once the marshmallow has completely set, sprinkle some more confectioners sugar on the work surface or on a silicon mat. Turn the pan over on the surface and use a knife or kitchen shears to cut the marshmallows. Roll the marshmallows in more confectioners sugar before storing in an airtight box. They keep fresh at room temperature for about 3-4 days. 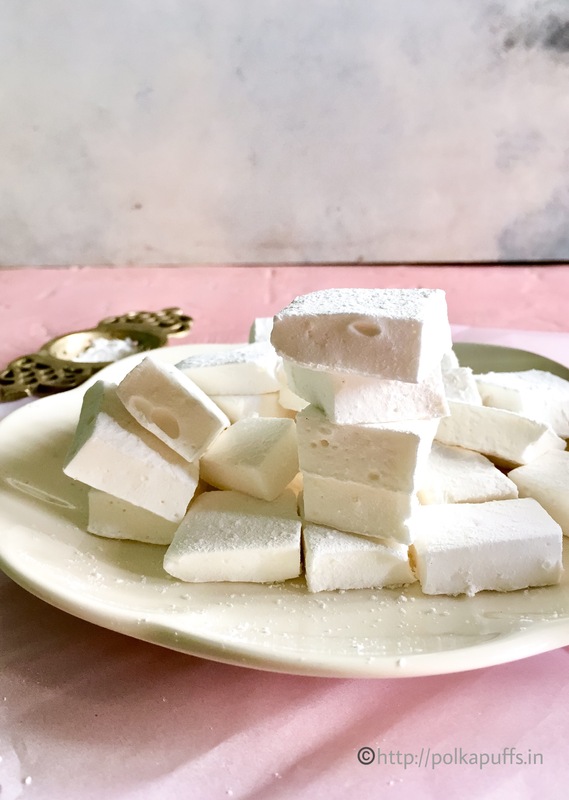 Small Batch Vanilla Mini Marshmallows are the perfect treats for the Holidays. 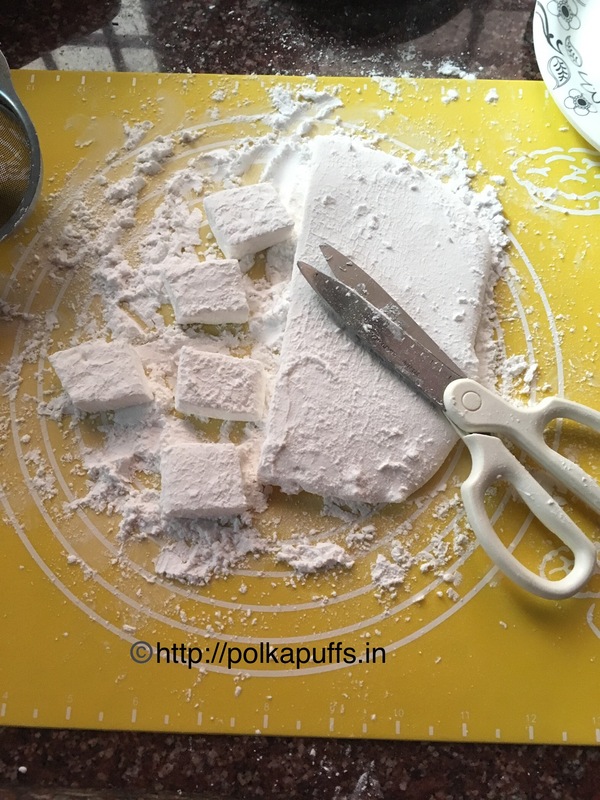 Soft, fluffy and melt in mouth bite sized Marshmallows are so easy to make, do try these soon! Dust the pan liberally with about 1/2 cup confectioners sugar and ensure you cover every corner. Take 3 tablespoons of water in the mixing bowl and sprinkle gelatin over the water. Do not stir. Set it aside so that the gelatin can bloom. Clip on a candy thermometer on the side of the pan. Let the ingredients boil till the temperature reaches 238'F. Once the sugar mixture reaches 238'F, take it off the heat and keep your electric hand whisk ready. The texture of the mixture after beating for about 8-10 minutes should be thick and shiny white. Once the marshmallow has completely set, sprinkle 1/2 cup confectioners sugar on the work surface or on a silicon mat. 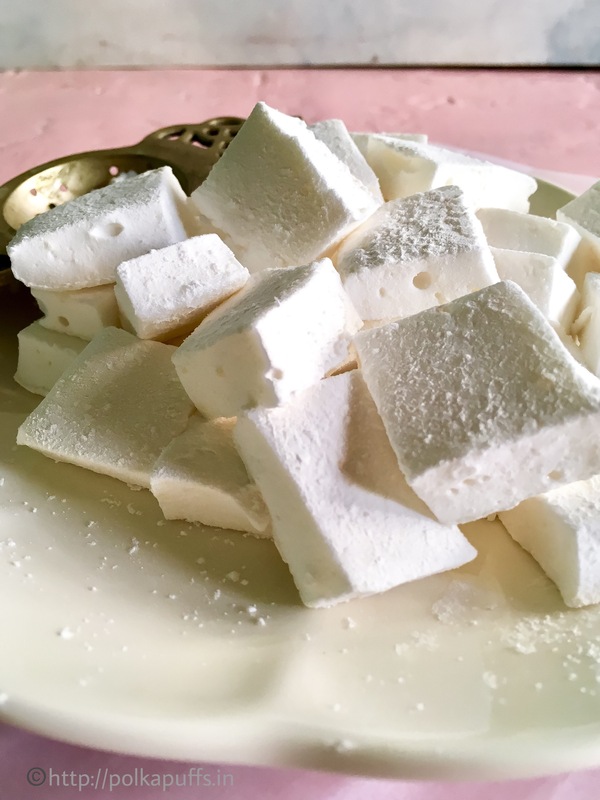 Roll every edge of the cut marshmallows in confectioners so that they do not stick together. Using a candy thermometer is essential, try with that for perfect results. The texture of the mixture becomes very thick and sticky so work quickly and swiftly. Linzer Cookies have been derived from the most traditional Linzertorte from Austria. The Linzertorte is a buttery tart filled with mixed nuts and black currant preserves but the American version has raspberry preserves in place of black currant preserves. 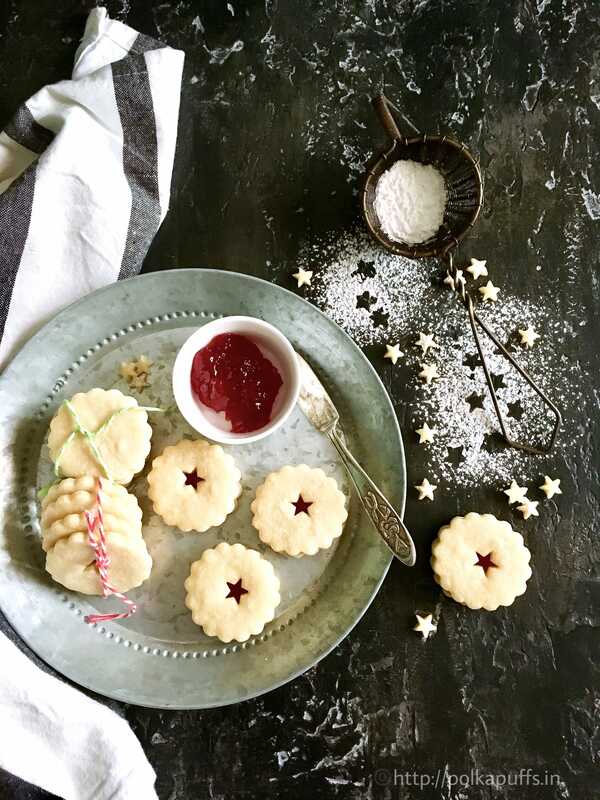 Linzer Cookies have the same basic recipe and method, only that the dough is cut and baked as cookies and later sandwiched together with some jams/ preserves. Pretty, aren’t they!? I just love how they look! I’ve used a small fondant plunger of star shape here because I’m not too fond of a very large cut-out center. 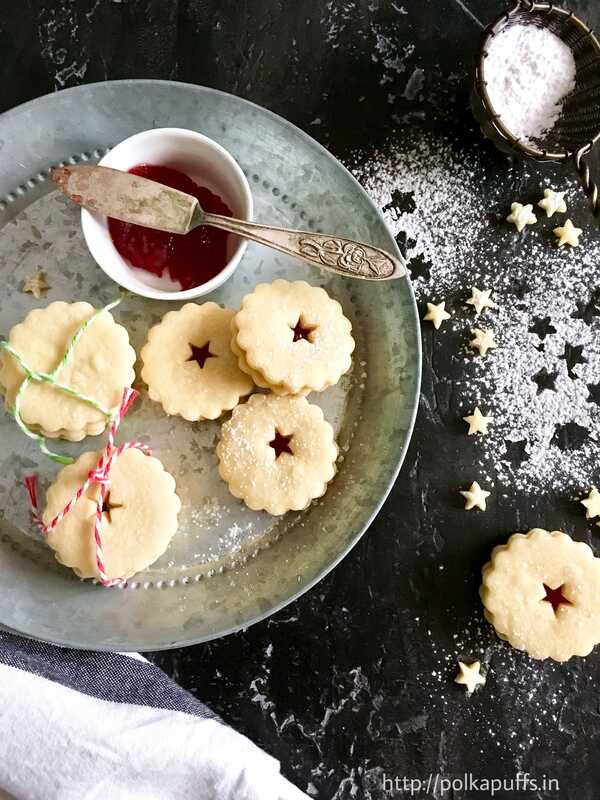 But that is up to you, use any shape or any size that you fancy for these Linzer cookies. Christmas being around the corner, I’m in love with this star shape! In the spirit of the festivities, I’m going crazy over everything that looks Christmassy 🙂 Besides, making these Linzer cookies was a breeze. I also used a dainty scalloped edge cookie cutter to ensure these cookies look prettier. If you don’t have any cookie cutters or plungers for the Linzer eyes, you can simply use a knife. First cut out square cookies, then use the same knife to make a small hole for the eye. You can even use bottle caps of different sizes to make the Linzer cookies. If you’re willing, you’ll find a way easily. I never had much baking accessories when I started out almost 3 years ago. I slowly built up my collection of necessities. There are still many things out there which I need but I can work without them very easily! Linzer cookies must taste better than they look, right?? I’ve used my Sugar Cookie recipe here with the addition of some almond extract for that traditional flavor. I’ve used strawberry preserve (store bought), although I wanted to use my homemade strawberry jam but I didn’t find good strawberries in the supermarket. You can even use raspberry preserve or apricot preserve. 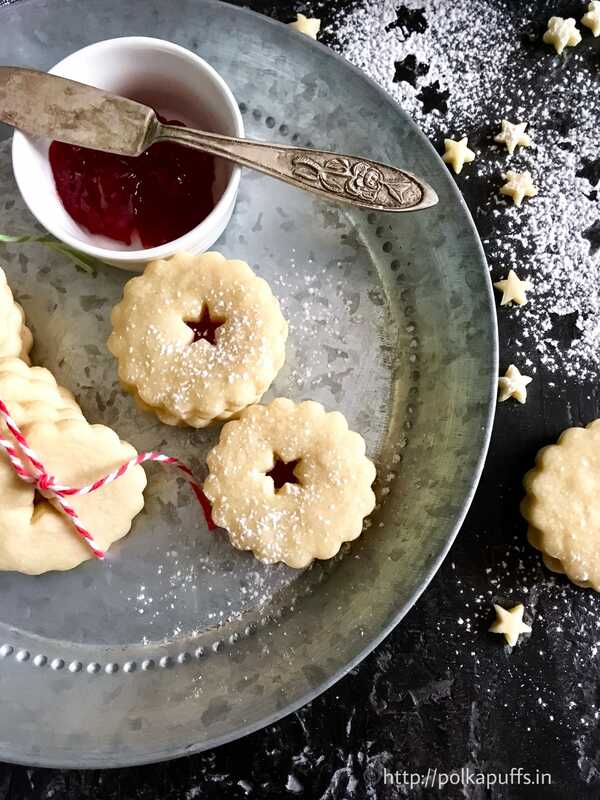 They all go so well with these Linzer cookies. Let’s begin by bringing the butter to room temperature. It must be soft, not melted. Take butter and icing sugar in a large mixing bowl, mix them well using a whisk. Do not over beat. Add almond extract and mix again. You can use some milk to bring the dough together. But do not add too much milk. I used about 2-3 tbsp. of milk approximately. Bring the dough together. 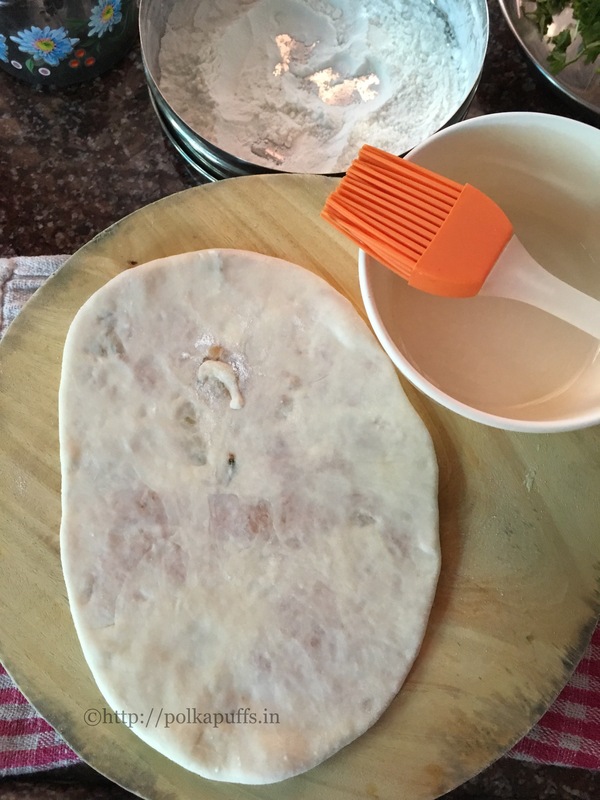 Wrap the dough in some cling and refrigerate for an hour to set the dough. In the meanwhile, line a baking tray with some parchment paper. Once the dough has set for 60 minutes, dust the kitchen surface with some flour. Roll out the dough to a thickness of 3-4mm. Cut out the cookies and place them on the parchment lined baking tray. Keep the cookies at least an inch apart. Cut out Linzer eyes for half of the cookies. Keep the other half plain. Refrigerate the cookies again for 15 minutes. This ensures that the cookies don’t spread while baking. Bake the cookies for 12-15 minutes or until the edges turn golden. Remove the cookies from the oven and let them sit on the hot baking tray for 10 minutes as they continue to crisp up further. The cookies are soft when they come out of the oven but they will turn crisp. Place the cookies on a cooling rack to let them cool completely for about 30 minutes. Once all the cookies have cooled down, spread some jam on the plain cookies and sandwich it with a cut out cookie. Dust with some icing sugar if you like. Keep these cookies refrigerated in an airtight box and they stay fresh for up to 4-5 days. Let's begin by bringing the butter to room temperature. It must be soft, not melted. Once the dough has set for 60 minutes, dust the kitchen surface with some flour. 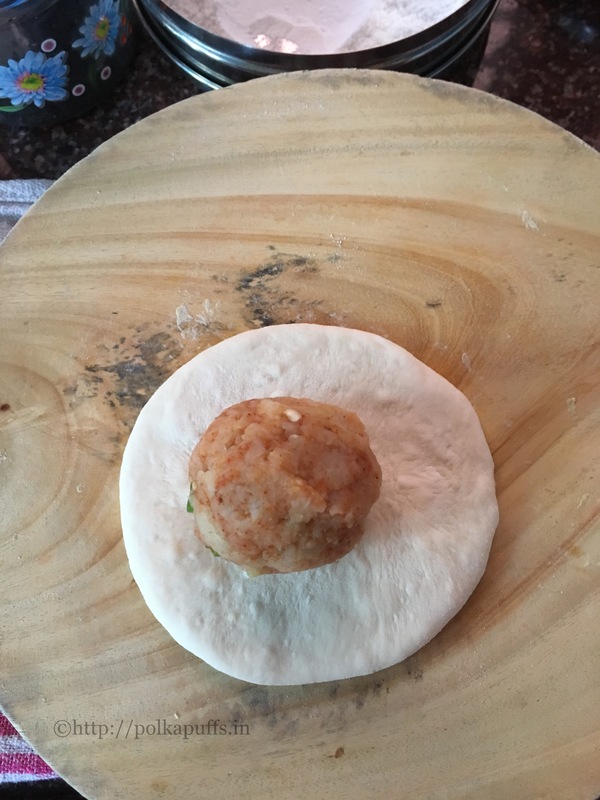 Roll out the dough to a thickness of 3-4mm. Cut out the cookies and place them on the parchment lined baking tray. Keep the cookies at least an inch apart. Cut out Linzer eyes for half of the cookies. Keep the other half plain. Refrigerate the cookies again for 15 minutes. This ensures that the cookies don't spread while baking. Remove the cookies from the oven and let them sit on the hot baking tray for 10 minutes as they continue to crisp up further. The cookies are soft when they come out of the oven but they will turn crisp. Do not try these with whole wheat flour, they wont taste very nice, besides those aren't traditionally Linzer Cookies. Use jams of your choice as filling, though raspberry and strawberry jams/ preserves taste the best. I think I’m getting there, Christmas is in the air and Linzer Cookies spell it!! 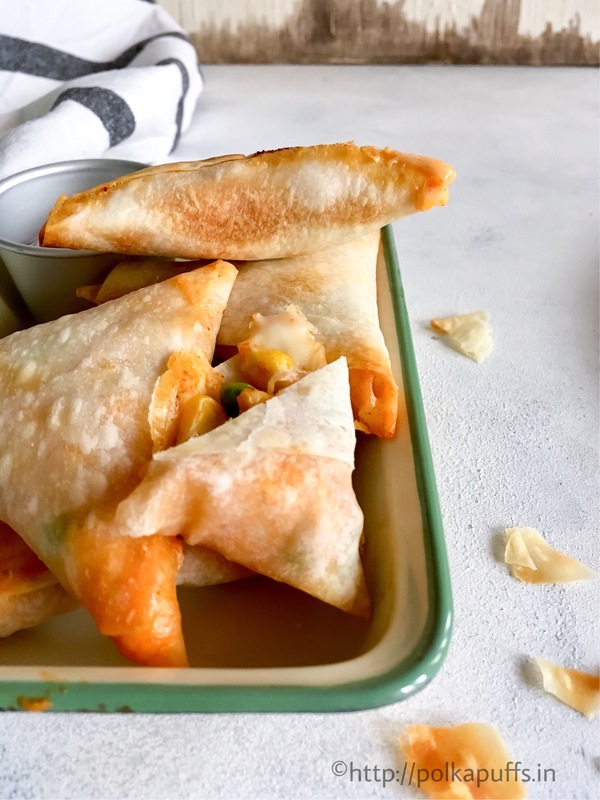 Baked cheesy corn and peas samosas are very easy to make and taste very delicious. Serve these with some tea or coffee and have a great tea party! 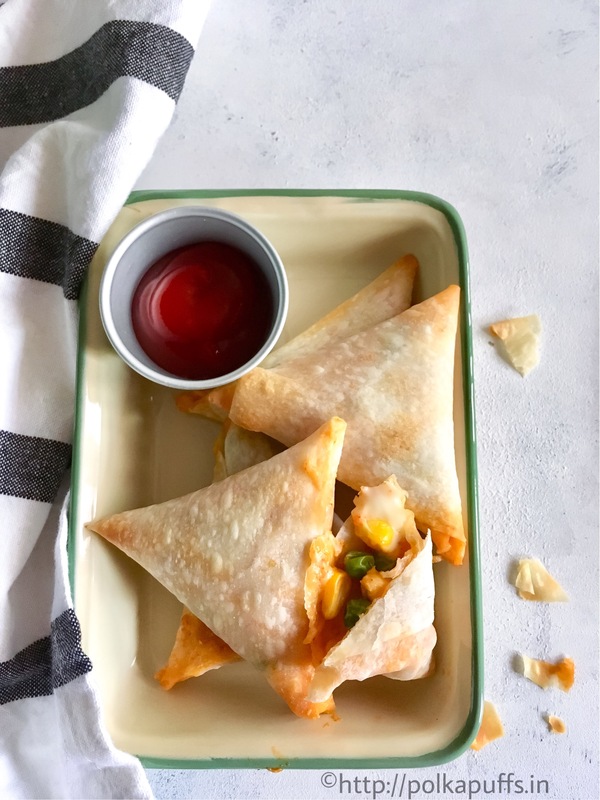 These samosas are very easy to put together and use all the basic pantry essentials. You can play around with the ingredients in terms of flavors, the possibilities are endless. Also, great for those make ahead snacking options! Prep a batch and freeze these for up to 2 weeks. This is what they looked like right before they went into the oven 🙂 I brushed these with some oil and they crisped up so well. 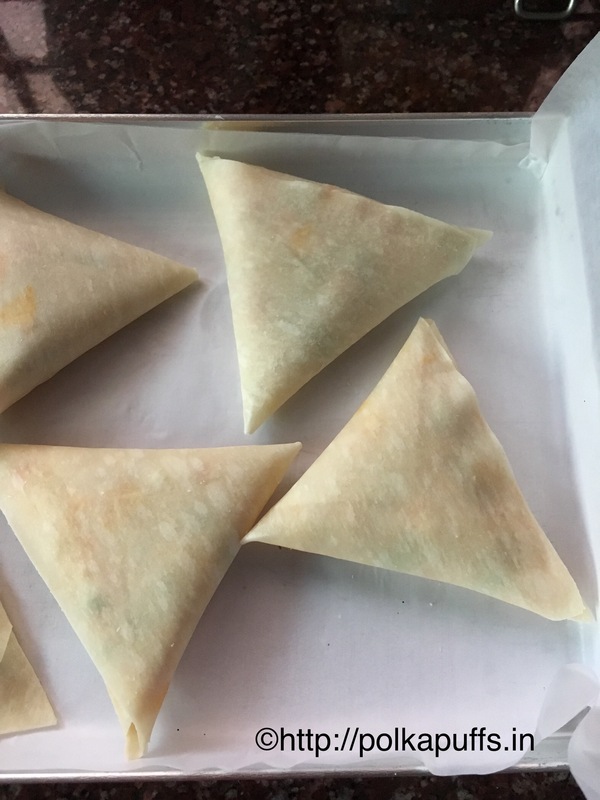 Folding these samosas correctly is very important. The samosa patti does dry out a bit while working on these so keep them covered under a kitchen towel. Dried pattis (pastries) tend to crack and folding them is very difficult hence keeping them covered is a good idea. Thaw the samosa patti (pastry sheets) at room temperature as per the instructions on the package. 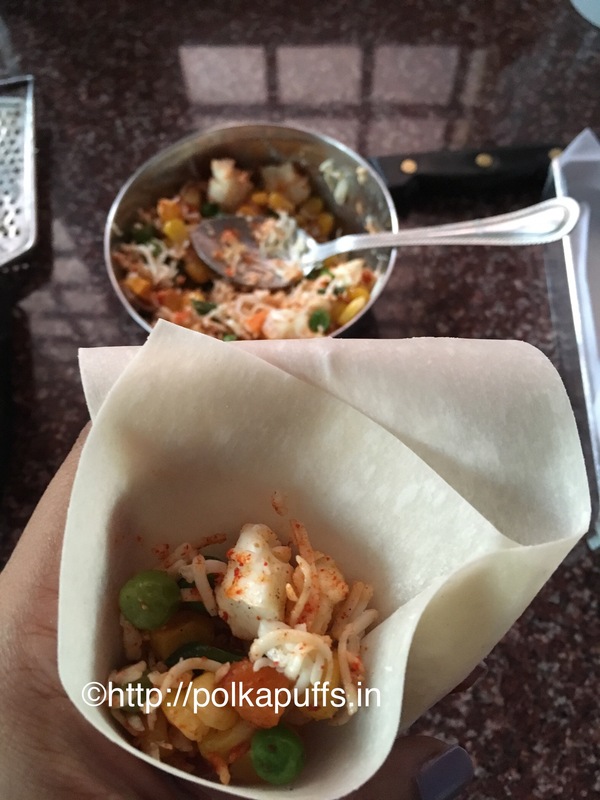 Mix corn, peas, grated cheddar, grated mozzarella, grated processed cheese, paprika, salt, chat masala and freshly cracked black pepper in a bowl and set them aside. Make the edible glue by mixing the APF and water. Make sure it’s lump free. The consistency of the glue is like that of a pancake batter. 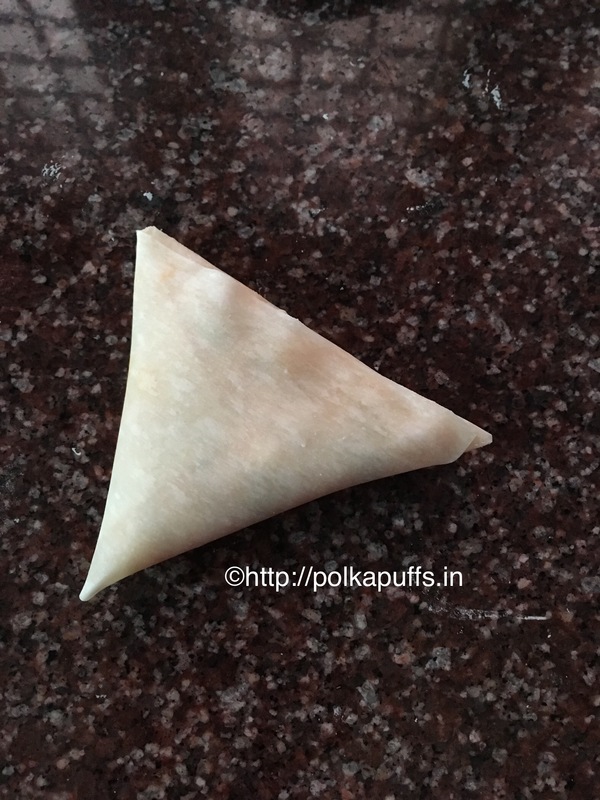 Take a patti, and fold one side over the remaining longer half to make a triangle. Use the edible glue and secure the edges and repeat the above step again and overlap the longer side of the patti onto the triangle. Now add approximately 2 tbsp. of the filling into the triangular pocket. Use some more glue and secure the open edges. Repeat the same steps for all the samosas. Lay them on a baking tray and brush them with some oil. Bake them @180′ C for 15-16 minutes. Once they turn golden brown, remove them from the oven and serve piping hot with dips of your choice. Thaw the samosa patti (pastry sheets) at room temperature as per the instructions on the package. (I left them on the counter for 30 minutes and they were ready to use). Make the edible glue by mixing the APF and water. Make sure it's lump free. The consistency of the glue is like that of a pancake batter. 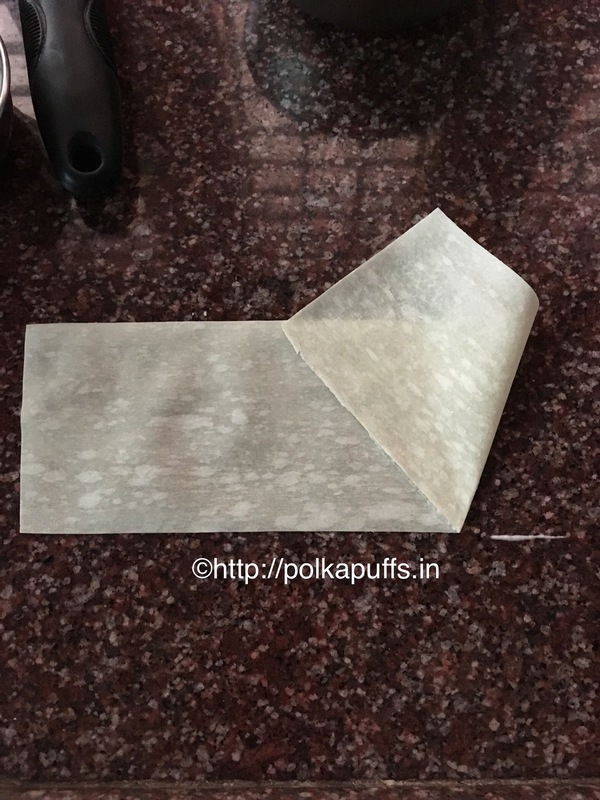 Take a patti and fold one side over the remaining longer half to make a triangle. Repeat the same steps for all the samosas. Lay them on a baking tray and brush them with some oil. Bake them @180' C for 15-16 minutes. Once they turn golden brown, remove them from the oven and serve piping hot with dips of your choice. Use a good quality samosa patti. Do not let the patti dry in the air, cover them with a kitchen towel. Make sure the edges are sealed well with the edible glue. The texture of the edible glue must be sticky. If making these to be stored in the freezer, them fill, fold and seal them well. Store them in dry and clean Ziploc bags in the freezer. They can be used up to 2 weeks. 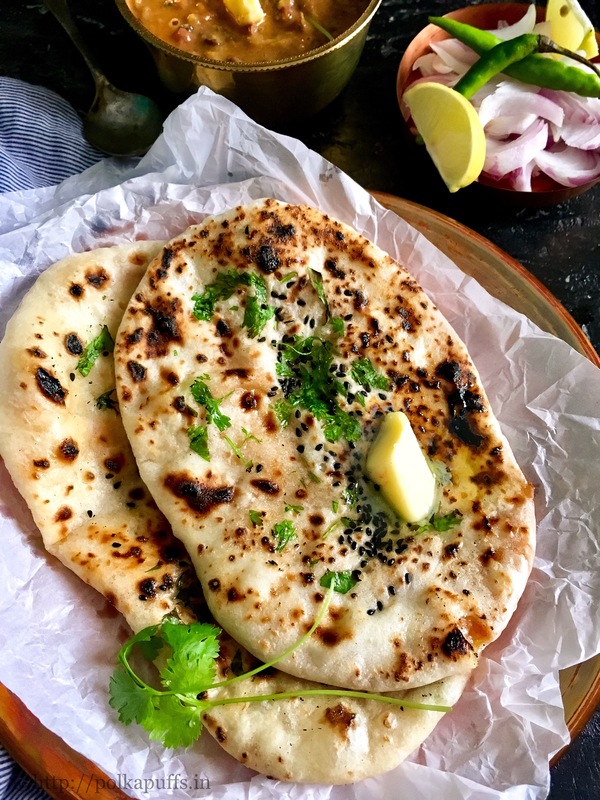 Amritsari Aloo Kulcha (no yeast, stove top method) – Kulcha is a type of leavened bread from North India, from the state of Punjab. It is made using All Purpose Flour (maida) and usually eaten with Chole or Dal Makhani . The dough is rolled into thick, flat and slightly thick shape and baked in a tandoor (large earthen oven). Once, they are baked to perfection, some butter or ghee is smeared on the top to enhance it’s taste 🙂 The best part about these Kulchas are that we don’t use yeast as a leavening agent. 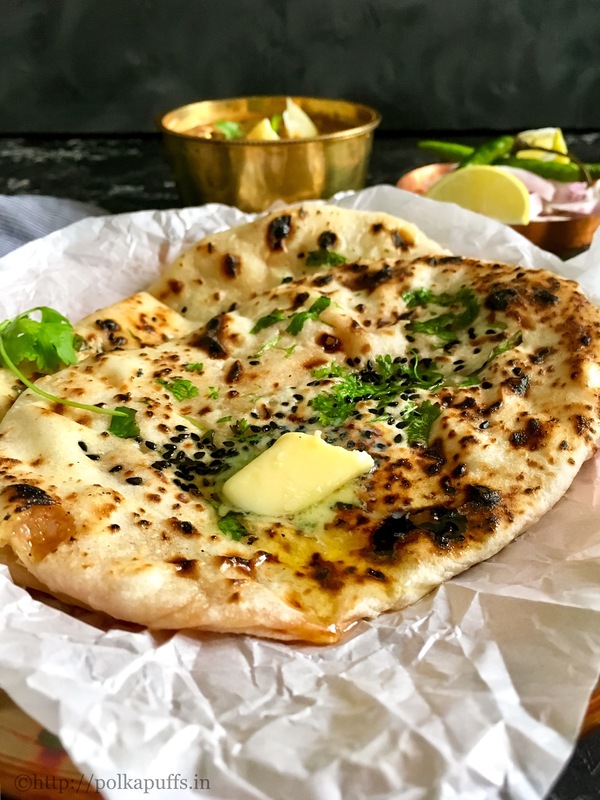 Amritsari Aloo Kulcha is very famous as it has a delicious, spicy filling of boiled, mashed potatoes along with some chopped green chilies and a few other ingredients to add flavor! 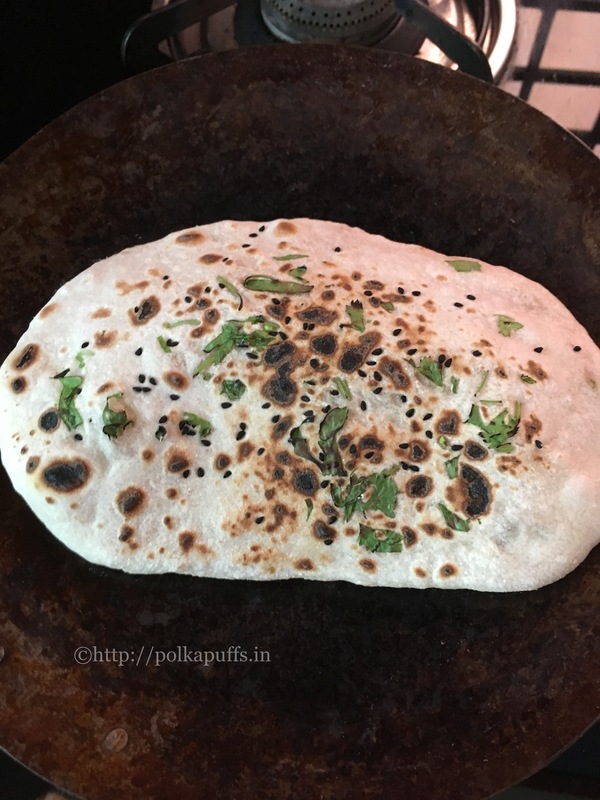 I usually make these Amritsari Aloo Kulchas on weekends or on Friday nights. It would seem like a heavy meal but if eaten in moderation, it isn’t half bad 😉 Besides, I always look forward to making something special on Fridays, I mean, the week’s almost over and I’m absolutely relaxed and enjoy spending an hour or so extra in the kitchen. This combination also seems like a pretty hectic menu but trust me, it’s not! 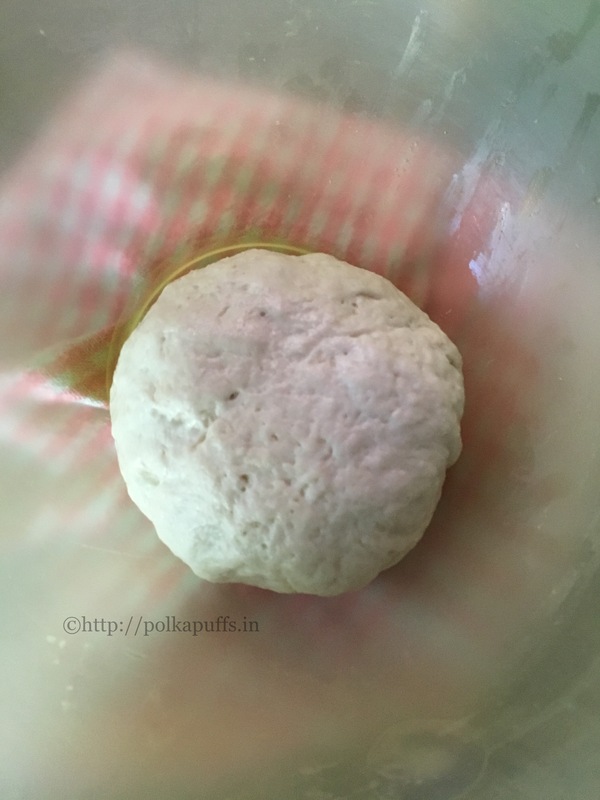 As I mentioned above at the beginning of the post, I usually pair these Kulchas with some Dal Makhani. They taste absolutely delicious together and a side of some onion salad is a must have. Have you guys tried my recipe for the dal makhani yet? Once these kulchas are baked/ cooked, it’s customary to smear them with a generous lob of butter or ghee. I mean you must add some just to make sure you get to enjoy the authentic flavors of this rustic flatbread. Besides, when in Punjab, do as the Punjabi’s do! Personally, I prefer butter over ghee. I feel butter adds a little depth to smokiness of these kulchas/ flatbreads. Add maida (APF) in a large bowl, followed by salt to taste, baking powder, baking soda, curd, oil and sugar. Next, use sufficient amount of lukewarm water to make soft and smooth dough. Knead the dough for 5 minutes. 3. Use a damp kitchen towel to cover the dough. Set it aside for one to two hours for the for the dough to rise. Mash the potatoes, add the other ingredients to the mashed potatoes and mix well. Set it aside for a few minutes for the flavors to incorporate well. Pinch a orange sized ball of the dough. Roll in in some loose flour and flatten it out a bit. Place the stuffing on the flattened dough. Pinch the dough together and ensure that the stuffing remains within the dough. Sprinkle some flour over it and roll the stuffed kulcha using a rolling pin. Flatten it out and give it a slightly enlongated shape. 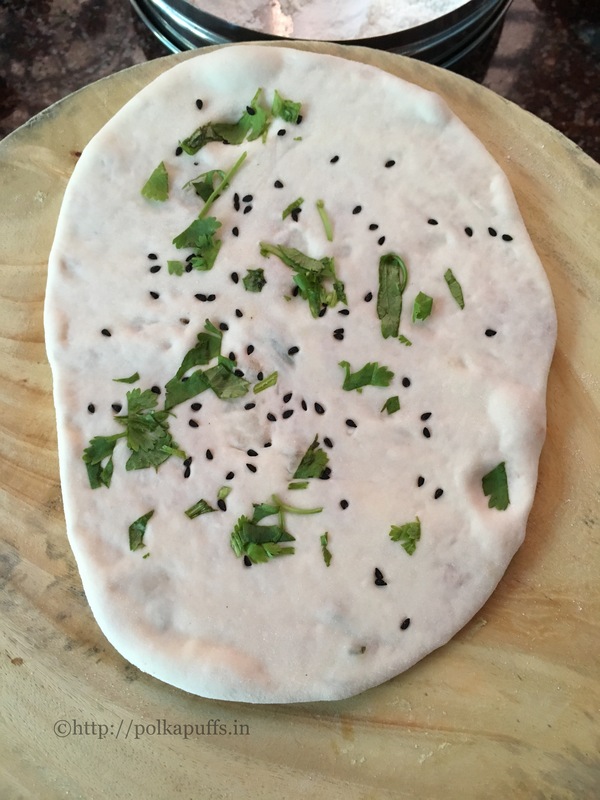 Sprinkle some nigella seeds and chopped coriander over the flattened kulcha. Turn it over and apply some water on the plain side. Alongside, heat a iron tawa on medium flame. Place the kulcha, wet side down on the tawa. Press the kulcha a bit and flip it over on the flame. Keep the flame on high and keep moving the tawa over it to ensure the kulcha gets cooked and golden brown all over. Once the top is done, place the tawa back on the stove to let the underside cook out evenly. Brush with butter or ghee before serving it piping hot!! Amritsari Aloo Kulcha is ready. 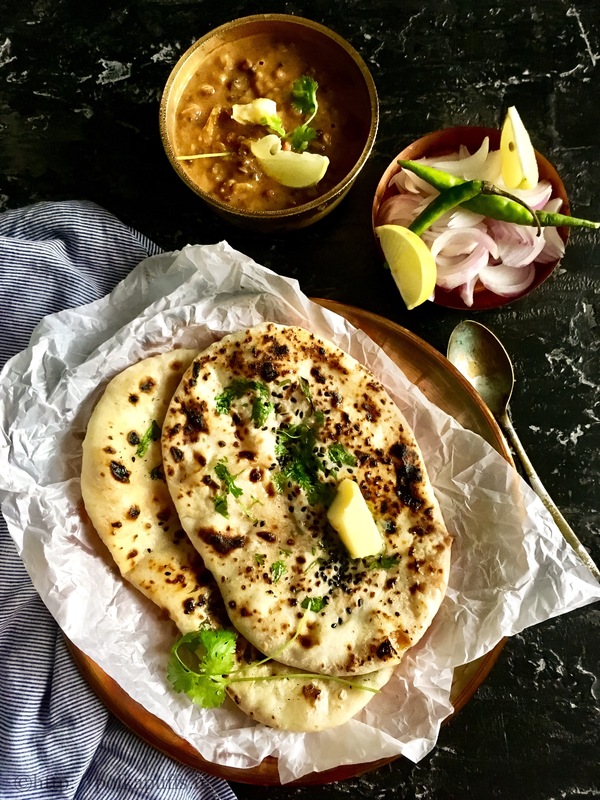 Serve it with Dal Makhani. 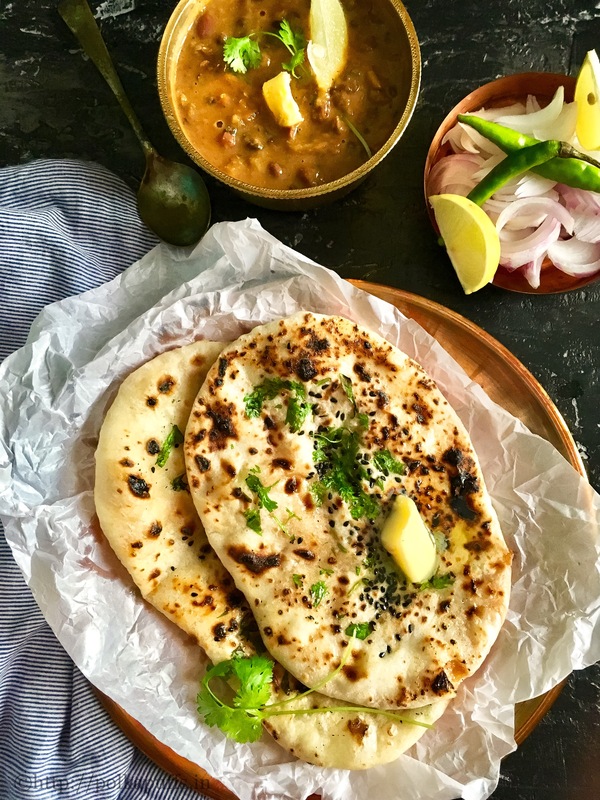 Easy to make Aloo Kulchas (Potato Stuffed Indian Flatbread) with some rustic Dhaba Style Dal Makhani. Add maida (APF) in a large bowl, followed by salt to taste, baking powder, baking soda, cured, oil and sugar. Use a damp kitchen towel to cover the dough. Set it aside for one to two hours for the for the dough to rise. Sprinkle some flour over it and roll the stuffed kulcha using a rolling pin. Flatten it out and give it a slightly elongated shape. Place the kulcha, wet side down on the tawa. 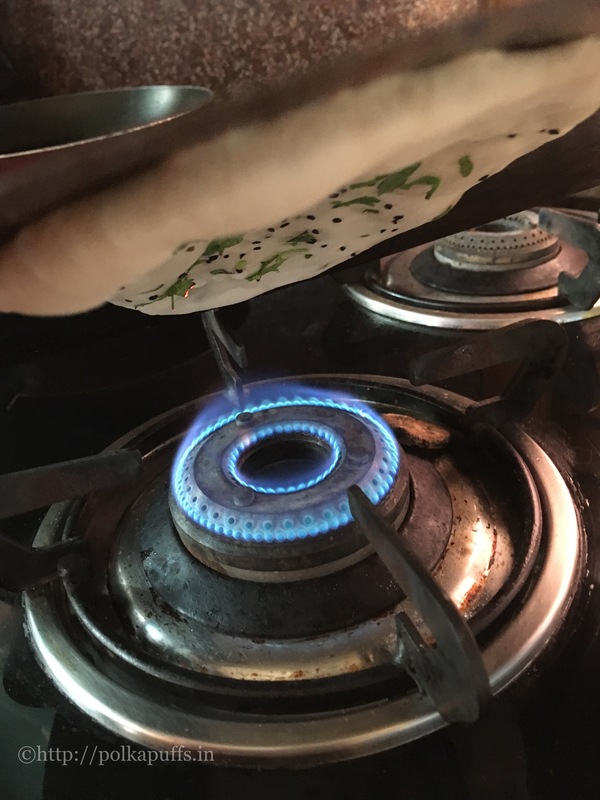 Press the kulcha a bit and flip it over on the flame. Once the top is done, place the tawa back on the stove to let the underside cook out evenly on medium flame. Brush the top with butter or ghee before serving it piping hot!! Do not use a non-stick tawa for cooking the kulchas as the kulchas will not stick on the tawa when over turned on the flame. I have used an iron tawa. Allow 2 to 3 minutes for the underside of the kulcha to cook as well once the top is cooked. Do not knead a very wet dough. The dough must smooth and soft. Indians and Malai Paneer go hand in hand! 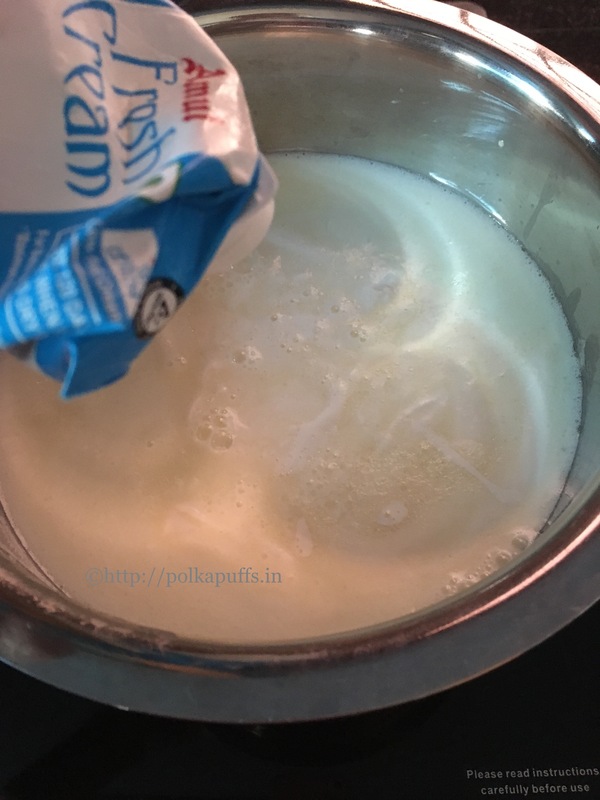 As many Indians are pure vegetarians, they consume large quantities of milk based products and Paneer tops the list 🙂 So, I thought I must share an easy recipe to make Homemade Malai Paneer / Indian Cottage Cheese at home and it’s better than store bought ones!! My hubby too enjoys paneer and likes his Laccha Parathas with some Paneer Bhurji for breakfast. And I have to agree with him, it’s healthy and very filling. A typical North-Indian start to our day. But many times, when paneer is store bought, it’s very chewy and particularly sour. It has a very sticky exterior texture, almost slimy in many cases. Such quality can put anyone off paneer. 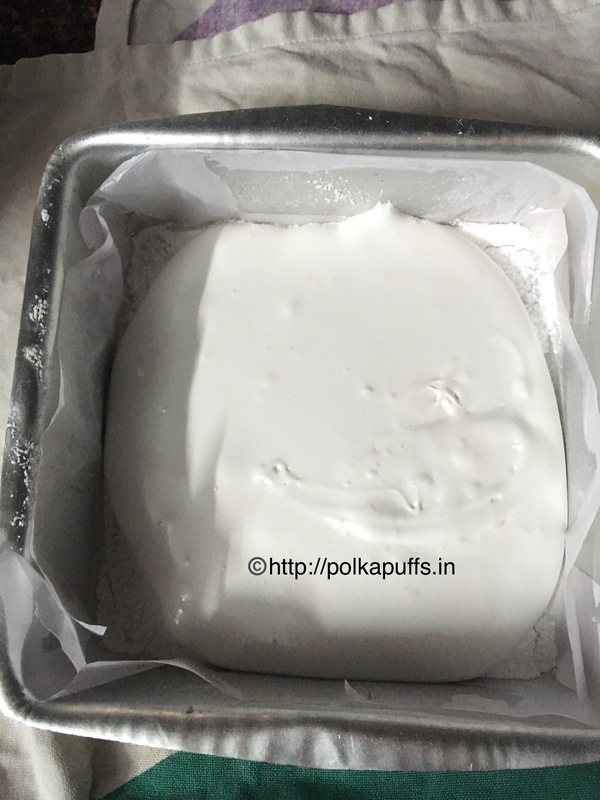 Such a texture can be because of many factors, one – the paneer isn’t fresh and has been packaged for many days, two- the paneer is adulterated and has cornflour and other such ingredients, this results in slimy exterior of the paneer. This can very disgusting and the flavour is always compromised. But what is more important is that it can be made very easily at home. Most of us feel it’ll be a very time consuming procedure and could be too tedious! I can assure you, it’s none of that! All I can say is that we need sometime in hand and patience….yes, please be very patient while making fresh paneer. 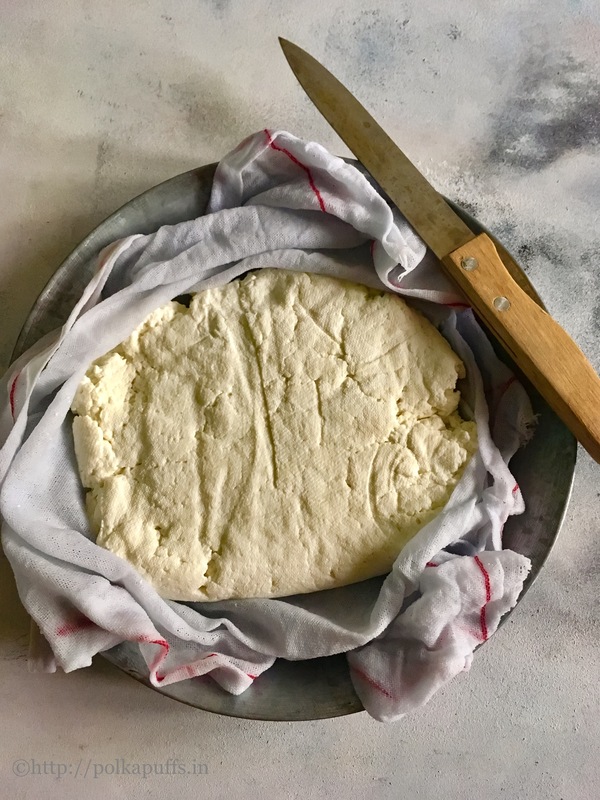 You can see the pictures here, it’s a rustic homemade slab of cottage cheese which is absolutely soft, melt in the mouth and just feels very creamy as the name suggests. But, it was not always that i knew the exact method to make this beauty, i referred to many recipes to understand the secret behind that creamy texture like we buy from the stores. 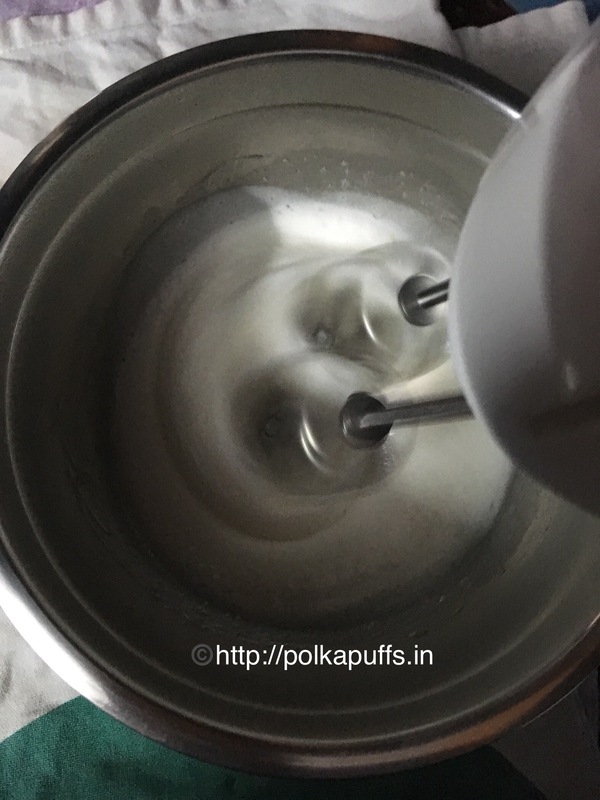 It’s Cream – yes, our very own Amul cream or any cream 🙂 I’m sure many may know about it but for me it was a revelation because so many websites don’t mention any cream in the recipe and their end results look very creamy and perfect! So, now even you guys are in on the secret …LOL! Plus a few very important points which I’ve learnt from my Mom. Let’s follow this step by step method for a better understanding..
1. Heat milk in a large pan, let it come to a gentle boil. 2. Then add the cream and mix well but with a gentle hand. 3. Then add the lemon juice. Mix well and reduce the flame to sim. 4. In about 4-5 minutes, the milk fats will begin separating from the whey. Turn off the flame at this stage. 5. 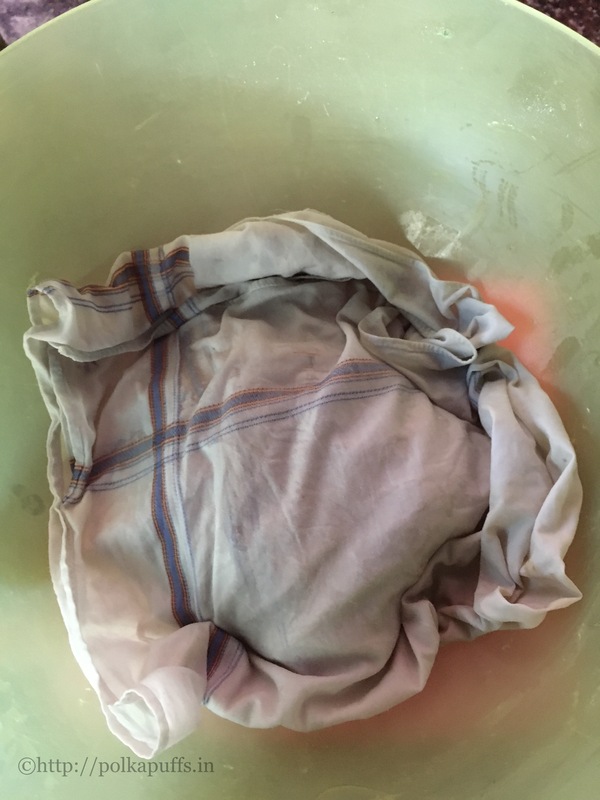 In the meanwhile, keep a muslin cloth or a cheese cloth draped over a large bowl, pour the split milk through the muslin/ cheese cloth and immediately squeeze out as much whey as you can. 6. Dip the squeezed milk fats in the cloth in a bowl filled with water and ice cubes for 2 minutes. 7. Place a heavy utensil on top of the cheese cloth and keep it that way for about 1-2 hours. This will ensure that all the water is weighed out of the paneer. 8. Once the paneer is set, use it as needed. To store it, keep the paneer wrapped in a damp cloth and refrigerated. 9.The paneer will stay fresh for up to 3-5 days if stored correctly. That’s your paneer. This recipe is easy to follow and needs no major equipment. 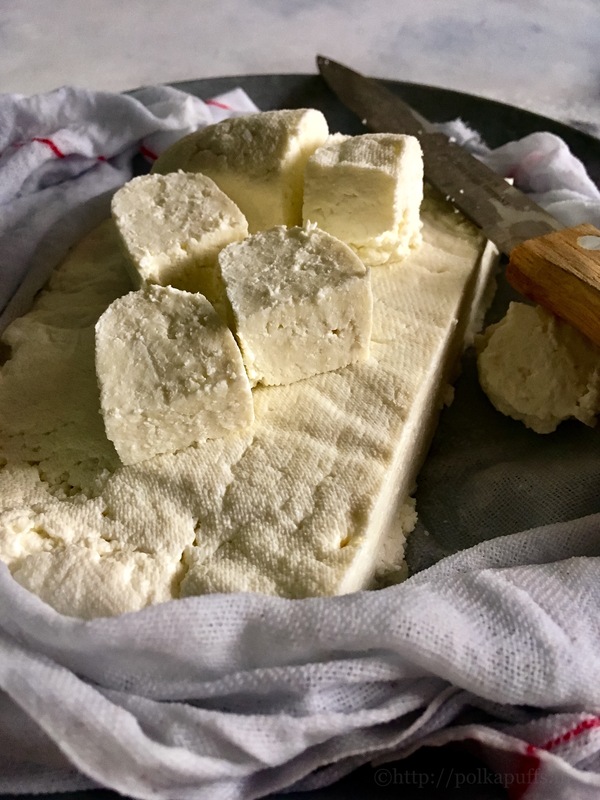 Creamy, melt in the mouth soft paneer is everyone’s favorite and here’s an absolutely easy, no-fail recipe for your own Homemade Malai Paneer!! Heat milk in a large pan, let it come to a gentle boil. Then add the cream and mix well but with a gentle hand. Then add the lemon juice. Mix well and reduce the flame to sim. In about 4-5 minutes, the milk fats will begin separating from the whey. Turn off the flame at this stage. 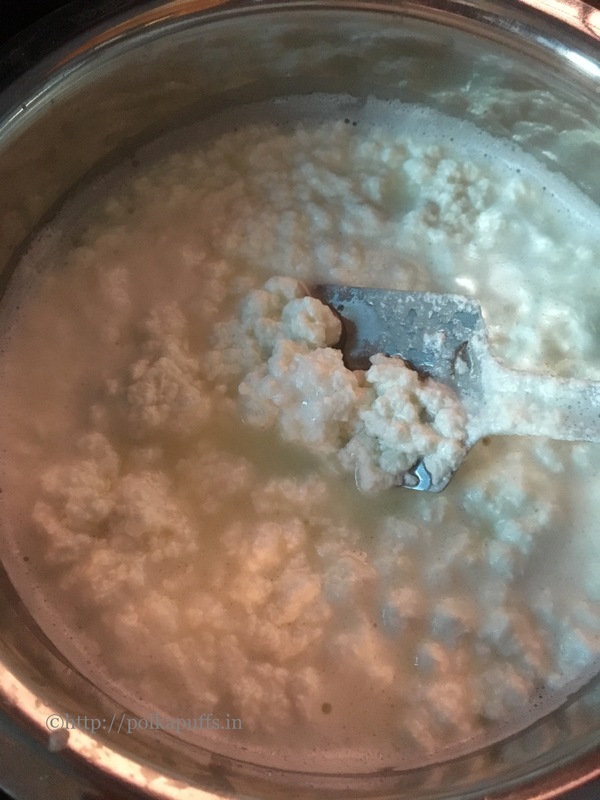 In the meanwhile, keep a muslin cloth or a cheese cloth draped over a large bowl, pour the split milk through the muslin/ cheese cloth and immediately squeeze out as much whey as you can. 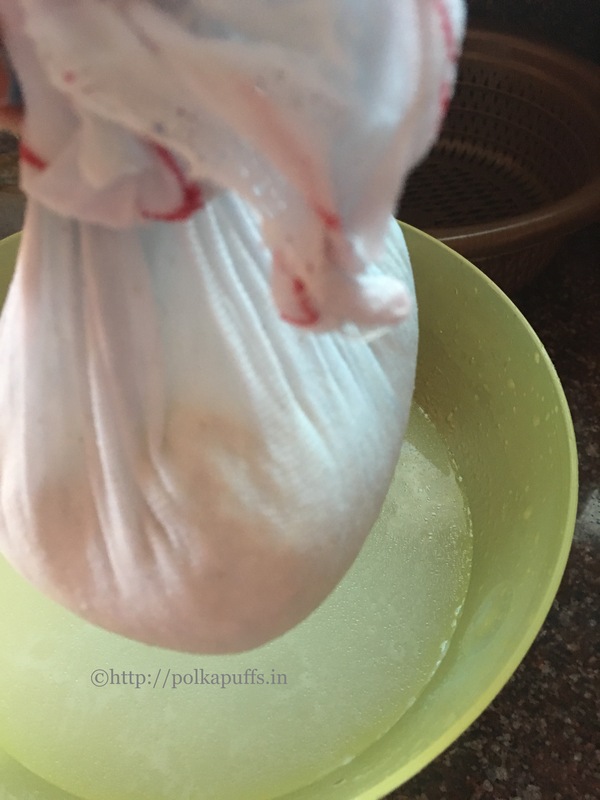 Dip the squeezed milk fats in the cloth in a bowl filled with water and ice cubes for 2 minutes. Place a heavy utensil on top of the cheese cloth and keep it that way for about 1-2 hours. This will ensure that all the water is weighed out of the paneer. Once the paneer is set, use it as needed. To store it, keep the paneer wrapped in a damp cloth and refrigerated. 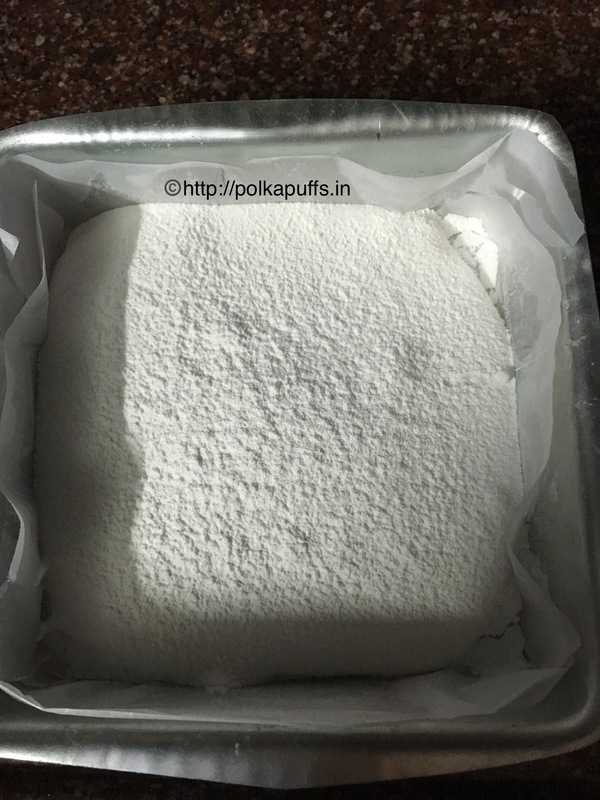 The paneer will stay fresh for upto 3-5 days if stored correctly. Please follow all the steps correctly. Do not over cook the milk once it has split. Pour into the cheese cloth immediately else the paneer will turn chewy. 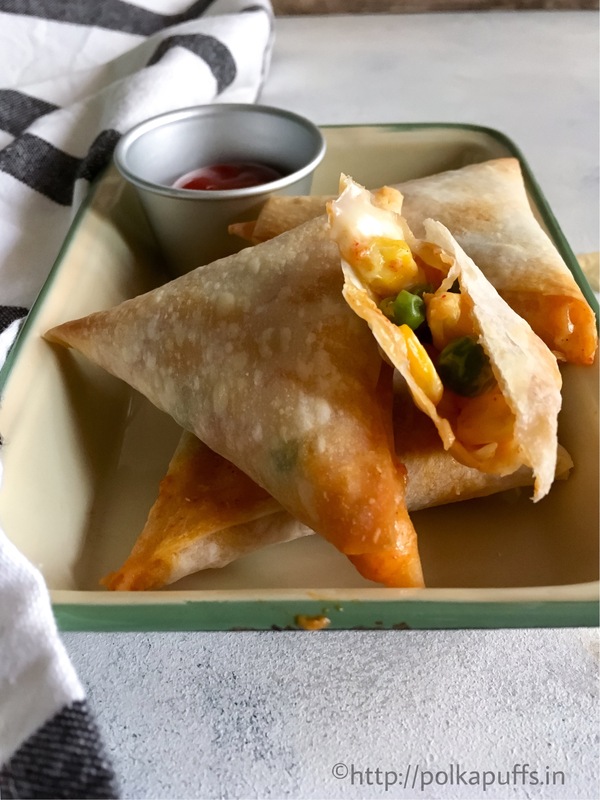 Always store the paneer wrapped in a damp cloth and cover it from all sides. The cream is added to improve texture and taste. Since we are adding cream, it will take a little extra lemon to split the milk so add more of it if necessary. Do try this one out, you’ll stop buying paneer from the stores!! Adapted from You Tube – Sanjeev Kapoor’s recipe. Speaking of great finds, I also find it interesting to try and make a new flavour combination right in the comfort of my kitchen! Earlier, I have shared the recipe of tropical iced tea which was a total hit! I make it every summer and we can’t get enough of it😀 I keep myself and the hubby hydrated as we sip on some of the most delicious homemade coolers. I have been told by people who have tried my Fruity Green Tea cooler, that it was one of the best ways to enjoy their green tea! Coming to this gorgeous beauty that has gotten you all parched is my take on two amazing flavours…tropical Pineapple and the very exotic Rose. Rose, on it’s own is very cooling. I have combined it’s flavours with the sweet and slightly tangy juices of local Pineapples and added my twist to it….😁 The resulting cooler/ mocktail is a bit spicy, has the freshness of summer mint and is loaded with ice! Just the thing you need in these sweltering afternoons. Equipment: mortar-pestle, measuring cups/ spoons, mixing spoons, 2 glass/ bottles of your choice to serve the drink. Muddle together mint leaves, chaat Masala** and ginger juice together in the mortar-pestle. Add two tsp rose syrup in each of the 2 serving glasses/ bottles. Top the rose syrup up with 1-2 tsp of the mint leaves, ginger juice and chaat Masala** mixture. Add ice cubes. Lastly, pour the Pineapple juice. The flavours will combine on their own, however, you can give them a quick stir. Garnish the drink with a sprig of mint! Enjoy! An Indian dessert that is loved by everyone and I guess there is rarely anyone who’d say no to Kulfi! This luciously creamy, deliciously sweet and chilled dessert is perfect for summers and compliments any Indian meal when looking for that perfect end to your meal 😍👌🏼 Flavour it with whatever takes your fancy! Mangoes….yes that is what I have used here to make it even more irresistible and delicious. Last year I had shared an easy recipe for Kesar Pista Kulfi on the blog and this recipe is another take on that!😀 You can add some chopped pistachios and almonds to this Mango Kulfi recipe and make it a Dry Fruit Mango Kulfi too! I used kulhad and matkas (Indian earthenware) of different shapes and sizes to set the Kulfi, you can use simple Kulfi or Popsicle moulds as well or simply use little stainless bowl to set them. Although the kulhad and matkas I have here aren’t actually earthenware, they are all made of porcelain. Equipment: a heavy bottomed pan, a ladle, measuring cups/ spoons, kulfi moulds/ Popsicle moulds/ small bowls, ice cream sticks etc. Heat 500 ml milk in the pan, let it boil until the milk reduces a little and becomes thick. Keep stirring so that the milk does not stick at the bottom and burn. Mix cornflour with 1/4 cup warm milk until it’s lump free. Add this mixture to the reduced milk and keep stirring until the cornflour blends properly with the milk. Add sugar, cardamom powder and the mango pulp. Cook for two mins more. Keep it aside to cool for a few mins. Next, lightly beat the cream. Add the cooled milk and mango mixture to the beaten cream. Beat again for a few mins (I used a electric beater). Fill this mixture into moulds/ matkas/ bowls and keep it in freezer to set for about 7-8 hours or even overnight. Once the Kulfi has set for 3-4 hours, put an ice cream stick in the centre of each mould if using Popsicle mould or traditional Kulfi mould. Thaw the frozen Kulfi for a few mins, rub the moulds between your palms, tug on the ice cream stick and unmould it gently. That’s it! Your creamy Kulfi is ready☺️ Look at that texture…..yumm! I am a proper Mumbai (Bombay) girl…born, raised, educated, worked and then married in Mumbai….when I say home, I always mean Mumbai❤….and saying that obviously means I love…just lurrvvvveeee my Mumbaiya (meaning typical) street food and snacks! The hubby and I visit every happening joint, cafe …etc, etc around our city but having some of the most delicious street food is something we can never give up! So I looked up a few recipes and found one which was easy and sounded a whole lot like what we usually got from outside…and they turn out quite good and crisp! I have been making there for over 2 years now…and a glass of hot lemon tea is all that I need to polish these off! Besides, making them is no big task either….it takes less than 15 mins of prepping and just another 30 minutes of cooking! Glutenfree (uses chick pea flour along with rice flour) and vegan (has no clarified butter or yogurt), one can easily include them in their special diets without any fuss. Serve them with a dip if choice or have them on it’s own…delish! I love serving these with this spicy red chutney. In a mixing bowl, add the sifted flours. Season with salt. Add hing at this point. Whisk well and add little water to make a thick batter. Add the ginger paste, lemon juice, chilies, red chili powder, turmeric powder, oil, toasted sesame seeds and chopped coriander leaves, whisk again. Add the baking soda and mix gently (don’t whisk). Grease the baking tin with some oil. Pour the batter into the greased tin and set it aside. Heat about 2 cups of water in a large pot or pressure cooker. Keep a metal plate at the bottom of the pot/ cooker to use as a seperator. Once the water starts boiling a bit, place the tin with the batter inside the pot/ cooker on the separator plate. Cover with a lid if you are using a pot. 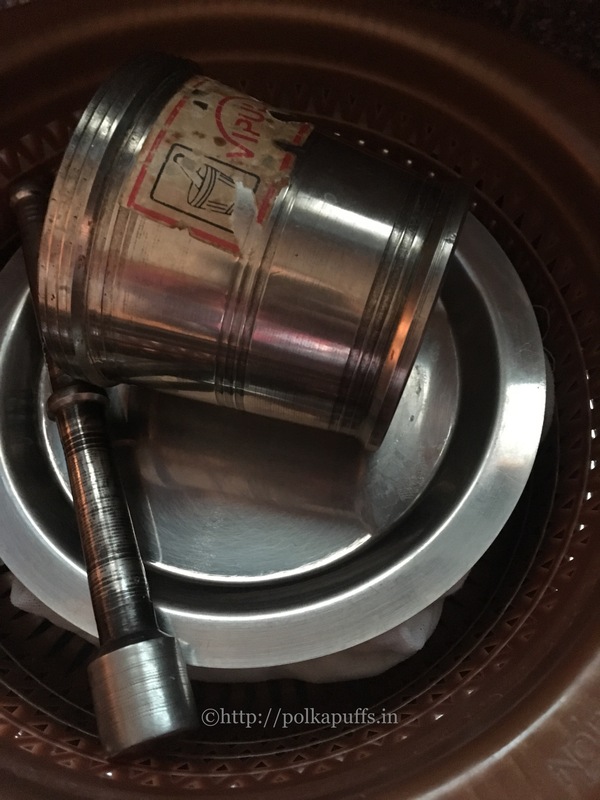 In case you are using a pressure cooker, remove the weight (whistle) off the lid and then secure the lid on the pressure cooker. Cook on low flame for about 15-18 mins. Then turn off the flame and open the lid carefully. Remove the tin from the pot/ pressure cooker and using a sharp knife check if the batter has cooked, to do that, simply insert the knife in the centre of the tin, if it comes out clean, the batter has cooked (just aswe do for any cake). Let this cool down completely. Once it has cooled, run the knife on all four sides of the tin and gently unmould it on a chopping board. Using the same sharp knife, cut it into squares. Keep them aside. This is what it looks like post steaming. Have them just as it is or pan fry. Heat 4 tbsp. oil in a frying pan, place the squares in the pan once the oil is hot, keep turning them around and let them crisp up on all sides. Once done, remove on absorbent kitchen paper. Serve them hot with a dip if your choice! 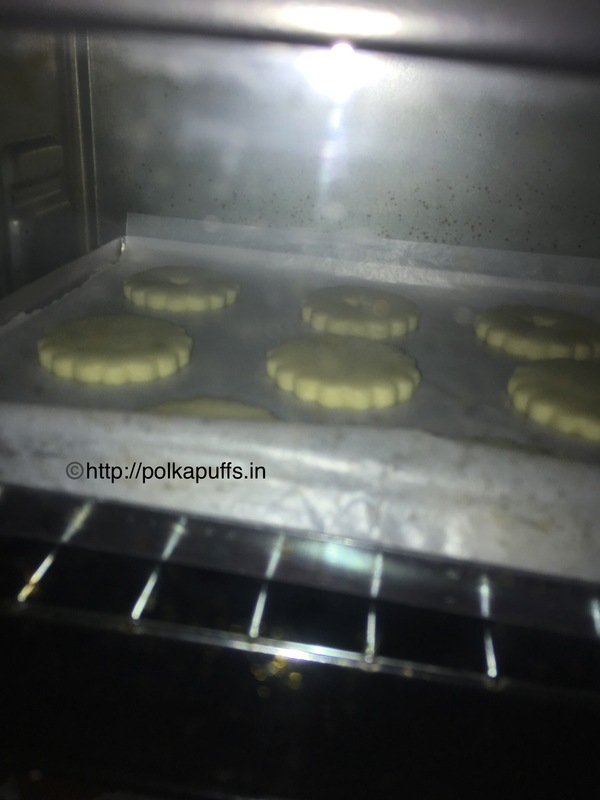 Yield: 16 small Wadis (nuggets) using a square baking tin of 5"X 5"
Maharashtrian snack - Kothmir Wadi or Kothambir Wadi is spicy, healthy and very flavorful! Perfect to go with your tea/ coffee! In a mixing bowl, add the sifted flours. Season with salt. Add hing at this point. Whisk well and add little water to make a thick batter. Add the ginger paste, lemon juice, chilies, red chili powder, turmeric powder, oil, toasted sesame seeds and chopped coriander leaves, whisk again. Add the baking soda and mix gently (don't whisk). Grease the baking tin with some oil. Pour the batter into the greased tin and set it aside. Heat about 2 cups of water in a large pot or pressure cooker. Keep a metal plate at the bottom of the pot/ cooker to use as a separator. Once the water starts boiling a bit, place the tin with the batter inside the pot/ cooker on the separator plate. Cover with a lid if you are using a pot. In case you are using a pressure cooker, remove the weight (whistle) off the lid and then secure the lid on the pressure cooker. Cook on low flame for about 15-18 minutes. Then turn off the flame and open the lid carefully. Remove the tin from the pot/ pressure cooker and using a sharp knife check if the batter has cooked, to do that, simply insert the knife in the center of the tin, if it comes out clean, the batter has cooked (just as we do for any cake). Let this cool down completely. Once it has cooled, run the knife on all four sides of the tin and gently unmould it on a chopping board. Using the same sharp knife, cut it into squares. Keep them aside. Heat 4 tbsp. oil in a frying pan, place the squares in the pan once the oil is hot, keep turning them around and let them crisp up on all sides. Once done, remove on absorbent kitchen paper. Serve them hot with a dip if your choice! The steamed nuggets keep fresh in the refrigerator for up to 2 days. The pan fried nuggets keep fresh in the refrigerator for up to 3 days. Pin it here for later!? They keep fresh for a few hours although I have never tried to store them for very long. 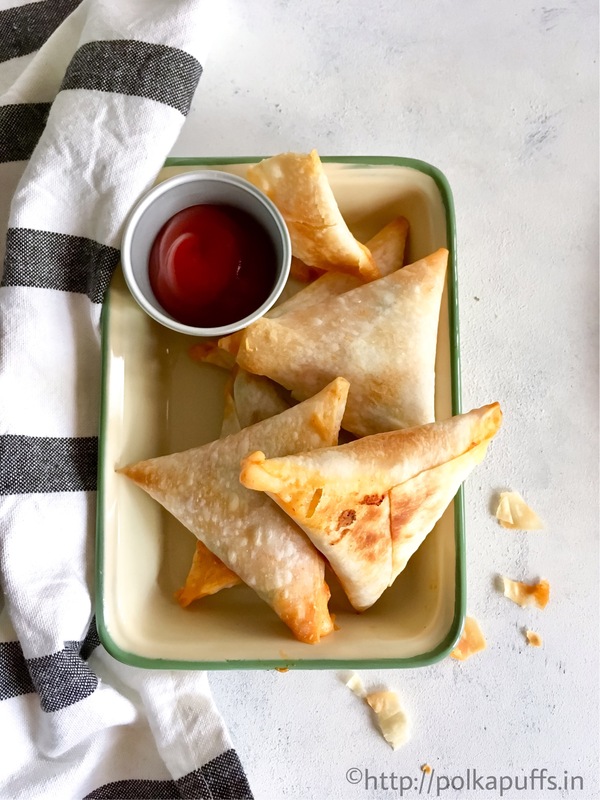 These make for a great party snack or even as a side dish to go with your meals! No, these brownies don’t contain strawberries….but I have been throwing these beauties on everything…literally! To my salads…my desserts..my breakfast…I guess my dal tadka is the only thing that is yet to be introduced to them berries 😂😂😂😂😂…. Anyways…we love a good brownie..so much less job than doing a proper cake and a lot more chocolatier than a chocolate cake even! It’s gooey and the flavours are so much more intense….if you know what I mean. The texture of this heavenly slice speaks for itself, doesn’t it!? And …this also has some Wholewheat flour…I mean I always to make a Wholewheat brownie but wasn’t sure if the texture so I tried using APF (maida) and wholewheat in 50:50 ratio. The first attempt was sad… I didn’t like the look of the brownie and neither was flavour sitting right due to the texture! In my first attempt, I had obviously over beaten the mixture which resulted in really uneven and gritty (read rough) textured brownies. Also, the butter was slightly too warm than necessary and that too was an issue. So, my second attempt which followed the first one in just 2 days, as I was curious to make it work. And work it did! I kept everything ready as always and kept reminding myself that I need to go slow instead of my quick ways! So, if you do try this recipe please follow the steps carefully. This time I didn’t over beat the mixture and carefully checked the temperature of the butter before proceeding to the subsequent additions. In my personal opinion, they could look a little better but working with wholewheat and APF that too with out eggs is a bit difficult for me….needs more practice! Use a good quality cocoa powder in this recipe as that is what adds the real taste. 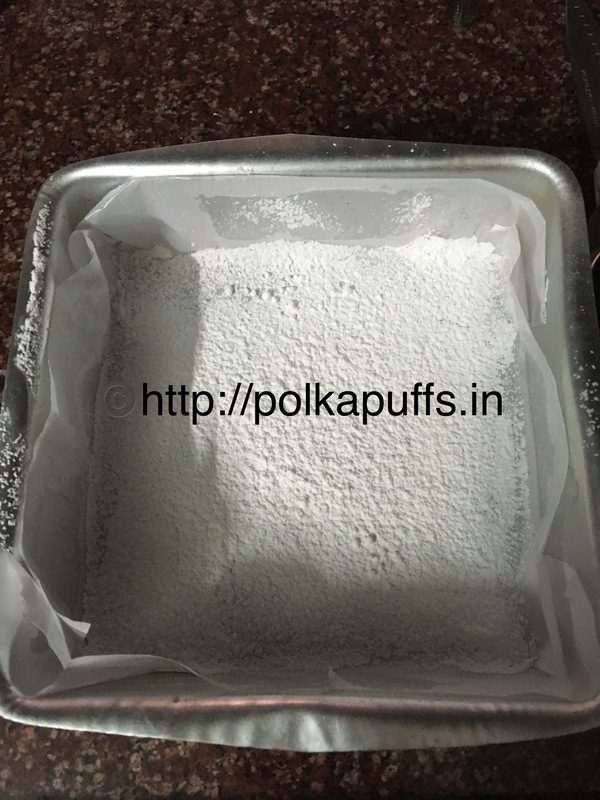 Line the baking pan well with parchment or baking paper or dust the baking pan carefully with the flour to avoid the brownie to stick to it post baking. There is nothing worse than a good brownie getting ruined because it was sticking to the baking pan. Never over beat the brownie mixture/ batter. It results in dry brownies. Never over bake the brownie. That will again make it dry and very crumbly. Let’s bake you a brownie! Equipment: baking pan (I used 7″ square pan), parchment paper/ baking paper, measuring cups/ spoons, heat proof bowl (or used stainless steel bowl), a saucepan, large mixing bowl, silicon spatula, a small wired whisk, cooling rack. 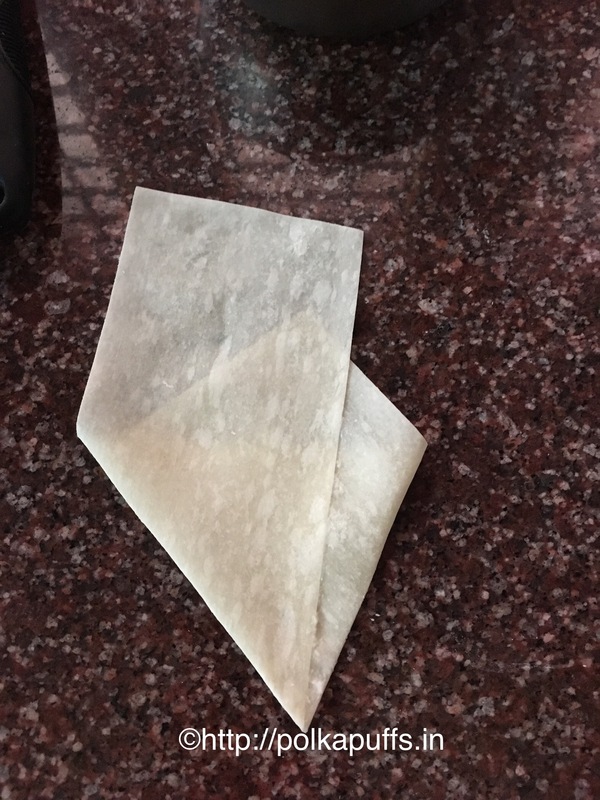 Line the pan with parchment paper/ baking paper. Alternatively, grease it with some oil and dust it generously with maida (APF). Set it aside. Heat 1 cup of water in the saucepan, it should not be boiling hot, just gentle bubbles are enough. Place a heatproof or stainless steel bowl on top of the saucepan in such a way that the base of the bowl I’d 2-3 inches above the level of the water below in the pan (method is called bain-mariè). Add butter in the bowl. Let the butter melt and simultaneously whisk it very gently to give an even texture. Be careful while doing this as the water below must not enter the bowl with the butter. Once the butter has melted completely, add powdered sugar and cocoa powder. Whisk again. The mixture will first look a little rough but keep whisking gently, it will turn out very smooth. Take the bowl off the saucepan now. Set this bowl aside to cool down for a few minutes. Then add the yogurt and vanilla extract at this stage. Whisk again and make sure the batter is smooth. Next, seive in the APF and wholewheat flour along with baking powder. Now keep the whisk aside and use a silicone or wooden spatula and gently fold the dry ingredients into the wet ingredients. Do not over mix. (If you feel the batter is way too thick and dry, add 3-4 tbsp milk in to batter and fold the batter gently. This step is optional, I added 1 tbsp of milk as that much was enough). Bake @180’c for 25-30 mins using just the lower heating elements/ rods. Once it’s ready, do a toothpick test – The test is different here, when the brownie is ready, the toothpick inserted in the centre must come out with some moist batter or crumbs. The toothpick must not come out clean. If it comes out clean, means the brownie has been over cooked. If you liked these then you must try Loaded MnM Oreo Bars or Nutties Brownie too! Looking for something more decadent….try my gooey Brownie Muffins. Paneer? Haven’t done that in a while now, have we!? Restaurant Style…under 30 mins? Ring a bell? Yeah…..my Reshmi Paneer is one such dish that fits every bill 😉 Tastes great, easy to make and loved by all!! 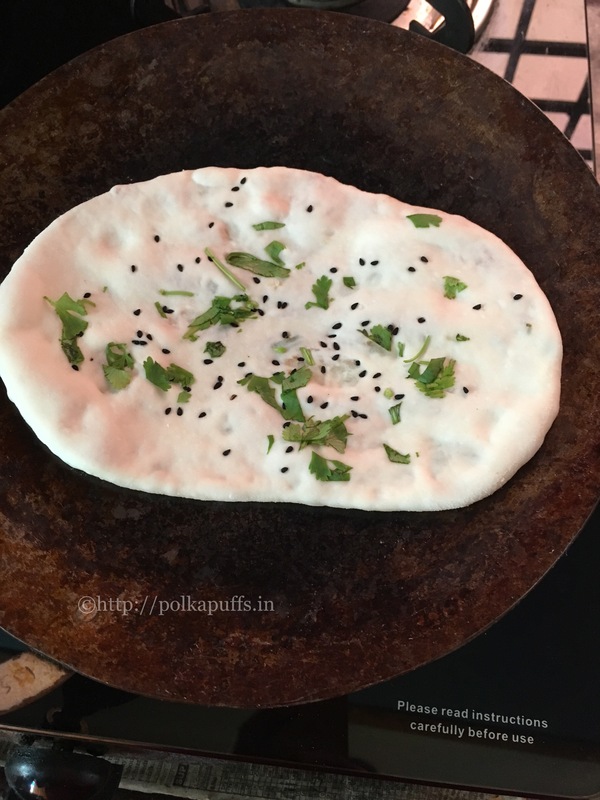 I love paneer (Indian cottage cheese) and often make it at home from scratch using full fat milk (it is very easy) but I stick to making Paneer only and only when I am out of veggies and need to get my meals ready in a jiffy! Or if I have some guests and I have planned 2-3 main dishes, Paneer is always one of them. So when I was out of veggies a few days ago, I made some fresh paneer and decided to make Dum Paneer Kali Mirch (juicy, succulent pieces of cottage cheese cooked with assorted spices, fresh yogurt and black peppercorns). Sounds good? Well, it’s much better than good….it tasted just like the ones we get at Restaurants and the spices were all well balanced. What I love about this dish is the depth of flavour that the crushed black peppercorns give and at the same time the yogurt ensures a luscious creamy gravy to mop up with some crisp and flaky Laccha Paratha 🤗 …however the Paratha that you see in the picture just above has approximately 24 layers… yeah…I do that sometimes..it was so good with the Dum Paneer Kali Mirch! Just add a salad or some raita…and you have a complete for yourself. If you are wondering what is ‘Dum‘, it is nothing but a process of slow cooking by covering the pot/pan with some aluminium foil or a dough of Wholewheat around the lid so that no steam escapes from the pot/ pan and all the flavours are locked into the dish. Equipment: a pan, measuring cups/ spoons, a ladle, blender. Cut the paneer in cubes and set it aside. Slice the onions roughly. Heat oil in the pan. Once it is hot, add the sliced onions with a pinch of sugar and fry them until they turn golden brown but not burnt. Remove the onions from the oil and let them cool completely. Once they have cooled down, blend them in a blender until smooth. Now, in the same pan which we had used to fry the onions, there is still enough oil. Heat it again, add the cardamom and the cinnamon stick. Let them splatter for a minute. Then add the hing and the onion paste. Cook the onion paste for 3-4 mins. Then add the green chilli paste and ginger-garlic paste. Cook until the raw smell goes away. Then season with salt, add red chilli powder, crushed black peppercorns, coriander powder, cumin powder and Garam Masala. Mix well and cook for 5-6 mins. You can add some water if the spices mixture is sticking to the pan. Next, add the cubed paneer and the yogurt. Mix well and be careful not to break the paneer. Keep stirring gently and cook them uncovered for 5 mins. Then add the fresh cream and some more water to correct the consistency.